(Newser) – The Pensacola News Journal has a highly interactive and informative look at a major discovery out of Florida: the oldest multi-year European settlement in the United States. “This is one of those almost once-in-a-lifetime type things,” University of West Florida professor John Worth says. "I didn’t even hope to find it as much as just wish.” The settlement is a Spanish colony established by Don Tristan de Luna in 1559—48 years before Jamestown. 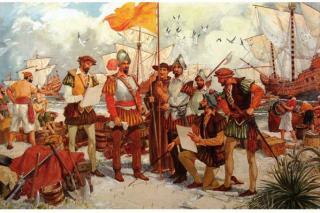 The Spanish government sent De Luna, 550 soldiers, 200 Aztecs, and African slaves from what is present-day Mexico to settle Florida's coast. Despite a hurricane destroying all their ships five weeks into the colony's existence, it persisted for two years. While Europeans lived in what is now the US earlier, none of the settlements lasted more than a few weeks. I see a lot of comments referencing Norse Vikings and their settlement in L'Anse aux Meadows in Newfoundland, Canada. While it is true, undeniable evidence was found in the 1960s that showed the Vikings did have a brief settlement in North America, this article regards the United States and a multi-year settlement. Unfortunately, neither of the Norsemen's settlement meet the above criteria. I would not be surprised if evidence is found proving there were earlier settlements then this. It is true that discovering an olive jar from one of the earliest settlements found on American soil may not be super exciting to many as I'm sure it's worth an insignificant amount in comparison to say, a gold coin but still, it would be cool to find in your own backyard. Hopefully, they can move the trailers to another trailer park, so the archaeologists can look around. As long as you accept it revisionist will alter history for their benefit. Get an education.